Staff and customers of Marshalls in Barnstaple have raised a fantastic £1,450.29 for the Caroline Thorpe Children’s Ward in North Devon. Team member Carol Grant has been raising funds for the Caroline Thorpe Ward for 36 years, since her daughter Tanya was treated on the unit. 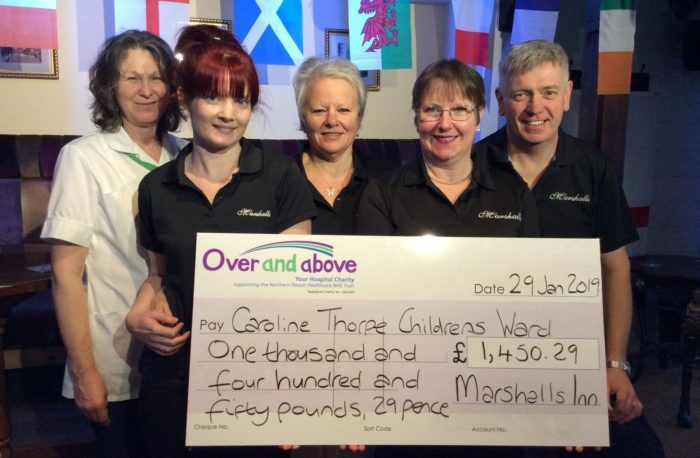 Since 2014 Marshalls has raised over £10,000 for the Caroline Thorpe Ward and Seamoor Unit helping patients receive care and support over and above that which the NHS can provide. Photographed L-R: Caroline Thorpe Play Leader Fran Greenaway and the Marshalls team of Krystal Cox, Carol Grant, Landlady Dawn Blackmore and Peter Harris.